The ECOWAS Court of Justice founded on May 28, 1975, is the judicial organ of the Economic Community of West African States (ECOWAS) and is charged with resolving disputes related to the Community’s treaty, protocols and conventions. The ECOWAS Community Court of Justice has jurisdiction to hear individual complaints of alleged human rights violations. The court reserves the jurisdiction to settle and examine cases bothering on human rights violations etc. It is now a ridicule for the ECOWAS Court Of Justice who bound by law, Is saddled with the responsibility to hear fairly, examine and resolve cases of human rights abuses, but who has now chosen to use adjournments as a delay gimmicks to further frustrate the innocent while favouring the offenders. Nnamdi Kanu versus fantastically corrupt Nigeria at the ECOWAS Court was first heard on the 5th of October 2016. But surprisingly, the counsels to the Nigerian government never showed up in court on the stipulated date for hearing. But came up with the flimsy excuse of having been to Kaduna for another court case, knowing fully the date of the hearing. The presiding judge had described their excuse as “not acceptable” and "dead on arrival" and therefore ruled that by next court sitting, whether the Nigerian legal representatives are present in court or not, he'll proceed to give his final ruling. 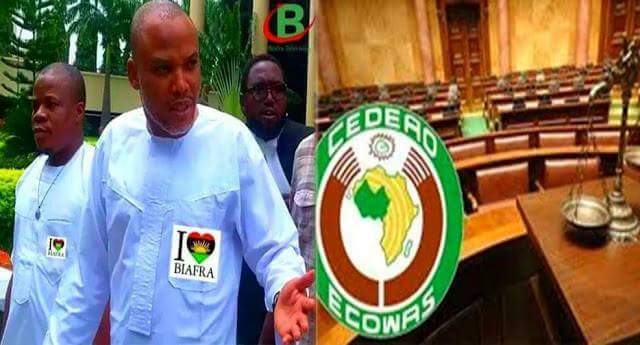 Still on that, Nnamdi Kanu has again been to the ECOWAS Court with the Nigerian state on the 8th of November 2016, yet no ruling was made, instead adjournment tactics was brought in by the Ecowas judges to keep the guiltless man incarcerated, which leaves one to wonder if the ECOWAS court of Justice truly lives up to its name. Ecowas Court with the promise of giving its final ruling on November 8, 2016, resorted to frustrating the case, rather than fulfilling its promise to make a ruling. After the postponement of a scheduled Ecowas Court sitting from the 10th of January, 2017 for an undisclosed reason to March 7th, 2017, the case was finally heard, but yet nothing good came out of it. It was the same old story with the same old pattern. Firstly, the defense team for Nigeria never appeared in court, secondly, there was no substantial evidence to keep detaining the man Buhari's government made a prisoner of conscience, thirdly, the Ecowas judge found that Nigeria does not have a case against Nnamdi Kanu but only aims to destabilize him emotionally, spiritually, physically and psychologically. Why then should the final pronouncement not be made by the Ecowas court to stop the further incarceration of the Biafran leader since it bothers on human rights violations and for which the Ecowas Court reserves jurisdiction. Nigeria is known to be fantastically corrupt and its representatives are pathological liars. It has obviously extended to the Ecowas Court of Justice which is supposed to be under obligation to settle disputes justly of any kind and human rights abuses, but who has chosen to play hide and seek games, thereby creating an atmosphere of confusion - what a shame. I attribute negligence to the Ecowas Court, as well as incompetence. It has displayed cruelty and partiality and has clearly shown that it's capable of being compromised and manipulated easily by a terrorist dotard and tyrant in the name of Buhari who wants Nnamdi Kanu frustrated. Nevertheless, we must ensure that justice is done and we would not be cowered into fear nor submission by a fraudulent and corrupt regime in a fraudulent contraption - nigeria. It was recently reported, that the former Ecowas Court judge Micah Wright, was suspended for what was termed incompetence and gross misconduct. Ecowas Court Judge currently handling the case between Kanu and Nigeria must be advised to tread with caution to avoid a reoccurrence of what happened to judge Micah. I love this. Justice shak prevail.